Wayne Chinn captured an exciting season opener under threatening skies that loomed over Oakshade Raceway all evening long, but the rain held off. Canadian driver Andrew Reaume had his car hooked up Saturday night earning an impressive heat race win and then set the pace early in the UMP Late Model Feature after starting on the pole. Jeff Babcock started on the outside of the front row, but stumbled in his Oakshade UMP Late Model feature debut. Babcock was running in the top five, but spun on lap four to bring out a caution relegating him to the rear of the field. Babcock would be a non-factor the remainder of the race. The defending American Late Model Series Champion Jon Henry worked his way up to challenge Reame for the lead after starting ninth. Henry eventually claimed the top spot for a few laps, but Wayne Chinn got by Reaume and then Henry to take the lead on lap 12. Chinn appeared to be on his way to an easy win as he began to open up his advantage. Dusty Moore held on to win the consolation race after a lapper made significant contact with him while he was leading midway through the race. Moore’s luck would run out in the feature when he brought out a caution after coming to a stop on the track on lap 18. 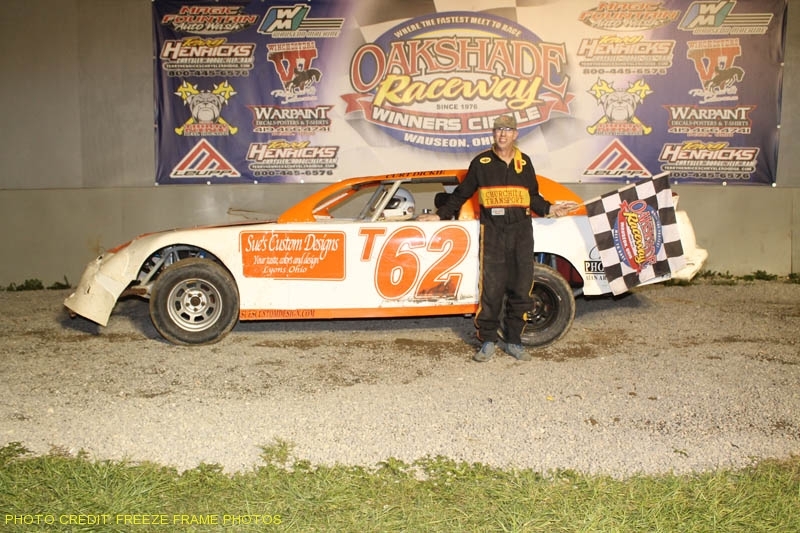 Oakshade Raceway instituted double file restarts this year for its feature events in its top three divisions. Chinn elected to start on the outside with Henry filling the spot on the inside for the restart. Henry stole the lead from Chinn just after the green flag flew once again. Henry held the lead until a late caution tightened the field for one last double-file restart. Henry chose the outside of the front row allowing Chinn to restart on the inside. Chinn shot off turn four like a rocket when the green flag dropped and snatched the lead away as he dove into turn one. Wayne Chinn went on to win the first UMP Late Model Feature of the year with Jon Henry slipping back to finish third in the final two laps. The national UMP Late Model point leader, Rusty Schlenk, snuck by Henry to take second. Brian Ruhlman and defending track champion Casey Noonan rounded out the rest of the top five finishers. BJ Gregory started on the outside of the front row of the UMP Sportsman Feature event and shot into the early lead ahead of Tim Fisher. A caution on lap two for Rich Ruff slowed the field early. The race got stuck on lap two as the caution flag continued fly after a series of double file restarts. Finally things got going after the field was forced to restart single file. Gregory proceeded to open up a commanding lead on a long green flag run. Gregory’s luck would run out as he worked through lapped traffic. Randy Franks was trying to stay on the lead lap and drove hard into turn three under Gregory. The two cars made contact and sent BJ Gregory bouncing off another car and spinning with just four laps remaining. Tim Fisher inherited the lead, but Tim Line was on the attack and got alongside Fisher at the white flag. Line made the pass for the lead in the final lap to pick up the victory. Tim Fisher had to settle for second followed by Mike Jessen, George Lindsey and Brett Miller, the defending track champion. Matt Lane and Jim Scout made some contact as they battled for the early lead in the UMP Bomber A Main. Both drivers led at least one lap, but neither would finish as both drivers retired to the pits within the first few laps. Garry Domoe found himself as the leader with Craig Dippman applying the pressure. The two drivers battled the remainder of the race with Domoe victorious over Dippman at the finish. Billy Brown finished third with Karl Spoores fourth. Veteran driver Roscoe Stetten wound up fifth after starting 13th. Multiple lead changes highlighted the UMP Hornet Feature with Drew Smith leading at the start. Dylan Herman snatched the lead after a restart after a caution on lap two. Herman almost got spun when a lapped car drove into the side of him, but Herman held on. Shortly after that near incident, Herman spun on his own turning the lead back over to Drew Smith. Smith could not hang on to that lead in the final laps as Derek Morris showed his hand late, getting to the inside of Smith at the white flag. Morris, the defending Hornet track champion, made the last lap pass to take the checkered flag. Smith finished second followed by Josh Froelich, Cody Stetten and William Cundick. The UMP Bomber B Main and C Main wrapped up the night’s events, but were marred with multiple cautions and high attrition. Because of that, both races didn’t make it the full distance as time expired prior to completing the advertised laps. In the Bomber B Main, Donovan Paskan led the first two laps until Ron Bloomfield Jr. took command for good. A late caution set up a one-lap shootout to the finish. Chane Stuckey worked his way up to second, but Bloomfield held on to win over Stuckey. Richard Riffe and Donovan Paskan got together and wrecked in the final corner while battling for third knocking both drivers out of the top five. Dan Plath, Jeff Geis and Josh Montague rounded out the top five finishers after each of those drivers started outside the top ten. Finally, in the Bomber B Main, Todd Silvey darted out to the early lead, but then fell off the pace on lap three. Joe Heffner took over the lead, but Michael Goodman quickly made it to the front and appeared to have a faster car than Heffner. Unfortunately for Goodman, mechanical issues knocked him off the pace and out of the race. Tim McNichol made an incredible move coming out of turn four on the final lap to edge out Heffner at the line, but McNichol spent a lap in the infield earlier in the race and was one lap down. Heffner was named the victor followed by Tyler Line, Rick Foreman and Andrew Shanks. McNichol finished fifth due to the high attrition rate in the race. The UMP Late Models, UMP Sportsmen, UMP Bombers and UMP Hornets will make the rounds once again on Saturday, May 8 at Oakshade Raceway. Gates open at 4pm with racing at 7pm.